Two new “entry level” units from France that feature some fetching idiosyncrasies, but more importantly, make music sound intense and involving. Anything designed by the French just has to be “different” (Citroen C6, anyone? ); I think it’s enshrined in their constitution. So forgive me for expecting garlic buttered eccentricity to ooze from every cranny of the Micromega CD-10 and IA-60. Funnily enough, while they’re a wee bit odd in some ways, these components are quite conventional in most regards. Micromega’s new range has been reviewing very well overseas, so once I heard the brand was on deck, I quickly arranged some samples to test before the units hit retail shelves. While it’s always tempting to get stuck in with the top of the range kit, you can learn more about the products by starting at the entry level, where the designers are most constrained by the bean counters. The Micromegas share the same slim chassis, which is a most attractive form factor in terms of looks and in not being intimidating chunks of hi-fi metalwork, which makes the WAF (Wife Appeal Factor) huge. Both pieces are well finished and though they’re not from the “10mm of metal up front or else” design academy, they’re not flimsy, although there’s plenty of ringing when the aluminium top covers are given a stern rap. Then again, the aluminum front panel and galvanized steel frame are very solid. There’s a big blue dot matrix LCD display on each unit, with nicely sized numerals that are legible from across the room. The bright displays can be turned off from the remote but not dimmed. Speaking of the remote, let’s cue up Eccentricity Alert #1! The grey plastic remote boasts no less than 46 buttons because it’s designed to control Micromega amps, CD players, tuners and AV processors. If there ever was a remote that called for illuminated keys, this is it. Fortunately, the only buttons you need regularly are reasonably easy to locate, so it can be used in the dark with a bit of practice (am I the only one who listens in the dark?). [Weirdo! – Ed] Six control buttons on each unit handle the functionality, with a rear mounted power switch and IEC socket handling power duties. The IA-60 amp has a swag of unbalanced RCA inputs round the back – four line level and one for a MM phono stage. The line level inputs can easily be renamed to suit the sources. There’s a front mounted 3.5mm “iPod” auxiliary input, although this will obviously work with any 3.5mm connected analogue device, as well as a rear RS232 port for integration to a home automation system. The front mounted headphone output uses a 3.5mm jack, supported by a dedicated headphone stage designed to drive 32 to 600 Ohm units. The amp has preamp outputs plus a set of inputs, which allow it to be used with an external AV processor as well as a subwoofer input and output, so it can be set up as a 2.1 stereo system or controlled by the AV processor in home theatre mode. There’s a single set of good quality speaker terminals. Volume is controlled by a stepped rotary dial offering fine 1dB level adjustments from -80dB (mute) to 0bB (flat out with the devil on your tail). Before we fire up the 60 watt IA-60, we encounter another strangeness, but it’s not really a French eccentricity so hold the alert. This is a manufacturer’s omission – the amp is rated at 60 watts into 4 Ohms and there’s no 8 Ohm power rating to be found anywhere in print or online. Assuming that the power supply isn’t capable of doubling from 8 to 4 Ohms, I’d ‘guesstimate’ that the IA-60 can push about 40-45 watts into an 8 Ohm load, so this isn’t a powerful speaker-crunching thing. Eccentricity Alert #2. The “HD Audio” logo on the front panels, which stands for Hybrid Digital Audio, is not High Definition as you’d initially assume. A cheeky choice, driven no doubt by someone in the marketing department, but you can’t get 1080P signals out of either unit. Hybrid Digital? Yes indeed. Which brings us to Eccentricity Alert #3. 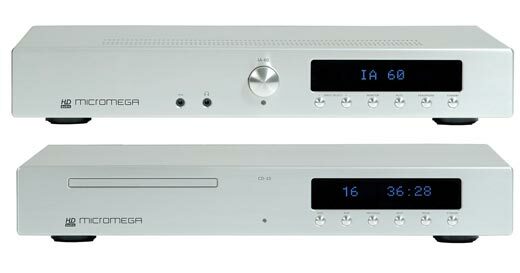 While some of the Micromega amps are Class D with conventional non-switchmode power supplies (a hybrid of digital and analogue – even if Class D isn’t actually digital), the IA-60 is Class A/B, so why does Micromega still call it a hybrid digital amp? Well, all the products carry the HD logo, so let’s assume it’s just an idiosyncrasy. The CD-10 features a narrow disc tray that slides out with intent and locks vigorously back into place like a money grubbing gnome’s bank vault. Eccentricity Alert #4. The speed of the disc tray can be set to fast, medium and slow. Talk about obscure customization options, but I like this degree of Gallic strangeness. There’s nothing fancy round the back, just two analogue RCAs and a coax digital output, but round front we find Eccentricity Alert #5. There’s nary a stop or open button to be seen, only a DISC button, which does both jobs. This actually makes sense: press DISC once to stop a CD, press again to open the tray. Saves at least a tenth of a second. I found your review very useful, especially because you mentioned also a short audition with cheaper speakers, more in the price range of the tested Micromega products. I would be curious how the IA60 excels on the bass side with the Jamo C803s, given the Jamos’ low impedance at low frequencies and the amplifiers moderate power output. I wish I would have put this question 5 years ago, but maybe someone with experience with this amp can answer me on this.